Is running barefoot beneficial? What is the most mechanically efficient way to move a piece of heavy furniture? Can stretching before a competition worsen performance? How do cats always land on their feet? The answers to these questions are all based on the science of biomechanics. 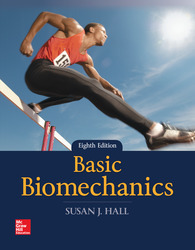 In Basic Biomechanics, Eighth Edition, the focus is on the anatomy and movement capabilities of the human body, explained with examples of relevant sport, clinical, and daily living applications. The quantitative aspects of biomechanics are presented in a manageable, progressive fashion, using a structured and problem-based format with practical advice.